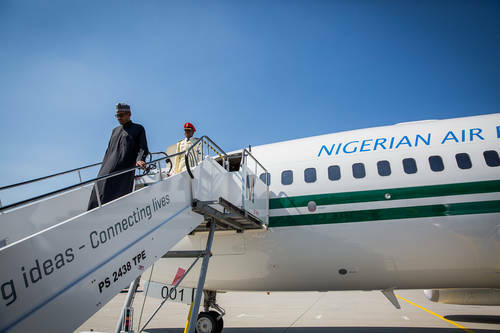 Mr. Buhari arrived in Abuja after attending the G7 Summit in Germany. A Presidency source told SaharaReporters that the president’s jet touched ground in Abuja at 12:53 a.m., but he and and members of his delegation did not arrive at the Presidential Lounge until 2 a.m. Shortly after his arrival in Abuja, Mr. Buhari asked to be briefed about the crisis brewing in the APC over the party’s choice of candidates for the Senate President and Speaker of the House of Representatives. Our source added that the president has summoned all lawmakers elected on the platform of the APC to an emergency meeting at 9:00 a.m. on Tuesday at the International Convention Center. APC legislators are expected to move from the meeting to the National Assembly to take part in the inauguration of the National Assembly. It is unclear if Senator Bukola Saraki will honor the invitation to meet with Mr. Buhari. Earlier today, the People’s Democratic Party (PDP) endorsed Mr. Saraki as their favorite to become Senate President. APC party officials had endorsed Yobe-born Ahmed Ibrahim Lawan as their official candidate for the Presidency of the Senate.